You can fix Driver_Power_State_Failure error on your Windows 10 computer. Fix all your issue related to blue screen error. Computer stuck on blue screen error. I have shared 4 different ways to fix this error. You don’t need to download or install any software. All you need is your Windows 10 computer, and you can manually correct this blue screen error. Sometimes it happens that we face a driver_power_state_failure error on our Windows 10 pc/laptop. So, the question arises here is how to fix driver_power_state_failure issue from Windows 10 PC or laptop? There are some ways to fix this issue form your Windows 10 PC or laptop. Hence, I would like to end the introduction here and let’s move on to the next part of the article. 1 What is Driver_Power_State_Failure Blue Screen Error? What is Driver_Power_State_Failure Blue Screen Error? The driver_power_state_failure error is found on the Windows operating system, mostly in Windows 8, 8.1 and 10. 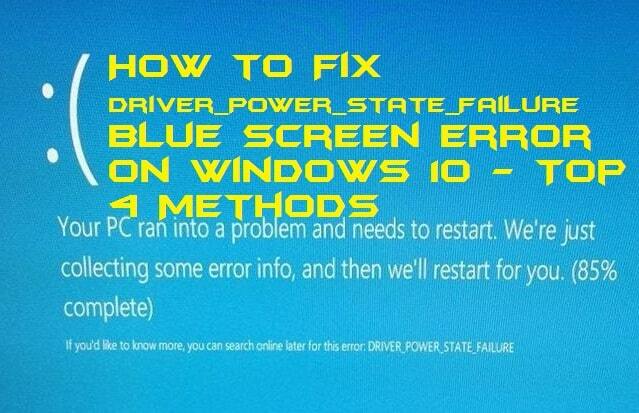 The driver_power_state_failure issue can be occured on your Windows PC/laptop by some reasons. Some reasons for it may be lousy hardware connected to your pc or laptop; incompatible settings have been saved, any driver crashed, or any other. In this issue, the Windows system keeps rebooting itself to sort out the problem. However, sometimes it happens that the Windows operating system didn’t find anything helpful. Though, it gets stays at the blue screen after the welcome screen or sudden while you work on it. You can even fix Windows 10 calculator missing. In this section of the article, I am going to explain you the top 4 methods to learn how to fix driver_power_state_failure on Windows 10. It is a quite severe issue which your Windows 10 PC or laptop is facing. But, don’t worry as I said that I have top 4 methods to solve it. Though, you can sort out using these methods very quickly. So, if you are ready, then we can start our list from the first method. Sometimes what happens is that some driver gets corrupted and then we got the driver_power_state_failure error. There is a quick way to find an update or reinstall that corrupted driver on your Windows 10 PC/laptop. I have shared that quick guide with you guys. Head up to the below guide to do so. Search for Device Manager in the search box and select it. After opening Device Manager, search for the exclamation marks over a driver. Now, right-click on it and select Update driver option. Follow onscreen instructions to re-install or update it. It may be possible that some technical issue has triggered a small part of your system. Thus, we will be facing the fix driver_power_state_failure error on your Windows 10 pc. For that, Windows has inbuilt system restore feature which you can use to sort out the problem automatically. What you have to do is that go to control panel search for system restore and follow on-screen instructions. I have also witness error Windows license will expire soon. Users can even fix that error. Maybe your Windows 10 PC is evil, and it wants some update to be done. Also, there may be some bug which your Windows 10 OS is getting while running itself on your PC. Then, you have to do a system update for that. There is a simple way to do so. What you have to do is that go to control panel on your Windows 10 Pc or laptop. Then, search for Windows update and click on Check for updates to update your Windows 10 PC or laptops. It would fix the issue if any bug triggered it under the system. Also, fix you have been denied permission to access this folder in Windows 10. If you are unable to find any appropriate way in fixing the driver_power_state_failure error on your Windows 10 PC. Then, you can use this method to do so. The thing which you must remember before doing this is that the C drive will be formatted completely. So, do it at your own risk. To do so, you have to create a bootable Windows 10 pen drive using any software. Once you have done it then plug that pen drive into your PC or laptop and follow onscreen instructions to aim the job. We just saw that how to fix driver_power_state_failure on Windows 10 PC or laptop. There are more ways available to fix the driver_power_state_failure error from your Windows 10 system. Generally, what other guys said is that they found a driver crash issue behind this problem. So, I hope using that you can solve your issue. However, after rebooting your Windows 10 will start working fine but, it’s your responsibility to fix it. 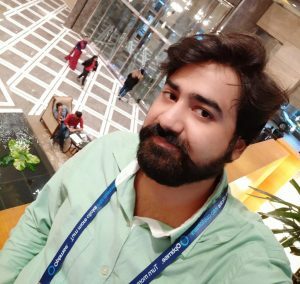 I hope using this article I have helped you in setting the issue. Share this article with the person who is facing the same problem.